When it comes to one dish dinners, some of my favorites to make are skillet dinners. A 12″ deep skillet makes just the right amount for our family…even leaving leftovers at times. To get a full meal into the skillet, it requires some meat or chicken, some veggies and some pasta or rice. I usually end up doing pasta because I have so much in my stockpile, and because I prefer to use brown rice when cooking and that just takes to long, especially when I’m in need of a quick skillet dinner! Most skillet dinners look like this…brown the beef or chicken…add some veggies and pasta, and then add the liquid and the pasta noodles. Different skillet dinner recipes vary widely on how much pasta to include and then how much liquid is needed. There are several factors that go into determining how much liquid is needed with the amount of pasta used. Including type of pasta, how much liquid is already in the skillet from veggies sweating, how much liquid has already cooked off, and the size of the skillet or saucepan that’s being used. Here’s how I measure it for quick cooking pastas, regular pastas and whole wheat pastas. Start with 2 cups of liquid for every 12 oz. of pasta. Then you will have to eyeball it…but you want it to look like what’s in the picture above. Enough liquid to cover most of the noodles. Then cook for 8-10 minutes, covered tightly. 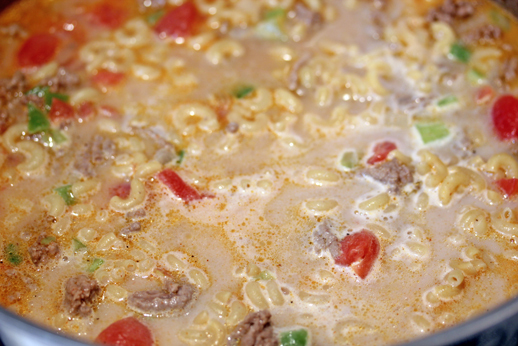 The noodles will soak up the liquid. I also recommend gently stirring the contents of the skillet once or twice…but do so quickly, as you don’t want too much steam and vapor to escape. If you add too much liquid by accident, remove the lid of the pan and let the water cook off. And if you don’t add enough, just add some smoking hot water from the tap, about 1/4 cup at a time. I hope this helps you better understand the method of making skillet dinners…and I hope my measuring tips will make your next pasta skillet dinner perfect! This entry was posted in How To, Skillet Dinner, Tips and Tricks. Bookmark the permalink. Thanks for the info! This is very helpful. witch 2 saga cheats a challenge for a game. Spy Fox in Dry Cereal is compatible with Flash. 2 saga cheats types. This is an exciting new genre of games. Have you tried pressure cooking yet? I wonder if it would use the same amount of water. Also, if you’re wanting quick dishes you may want to consider it. It’s the new favorite of most people. Wholly cow! I’ve been here before! lol! I’m disappointed though to see no one ever responded. A simple “No, I have not tried it,” would have sufficed. Tonight I’m making a skillet meal and wanted to figure out how to use angel hair without using another pot. Funny that I was brought here yet again. Too bad no one is reading the comments. I was using a box mail that only serves ‘5’, right…I wanted to add more to serve at least 8…but didn’t know how much more water to use for the wheat pasta (the box had huge white pasta)…so I was more or less guessing on the amount of noodles to use and how much water. So this was very helpful. I used 1 cup of noodles at first…ended up adding more water (trying to get the cheese sauce from the jar) so I added just over a half cup (?) more noodles…along with the two cups off water you recommended (then thought about the fact that you were saying 2 cups for EVERY 12 OZ! )… so far it looks ok…even though I forgot to put the lid on at first. Does it sound ok, would you make any other recommendations…considering the amounts I used?